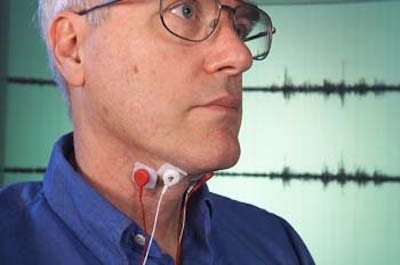 "What is analyzed is silent, or subauditory, speech, such as when a person silently reads or talks to himself," said Chuck Jorgensen, a scientist whose team is developing silent, subvocal speech recognition at NASA Ames Research Center in California's Silicon Valley. "Biological signals arise when reading or speaking to oneself with or without actual lip or facial movement," Jorgensen explained. "A person using the subvocal system thinks of phrases and talks to himself so quietly, it cannot be heard, but the tongue and vocal cords do receive speech signals from the brain," Jorgensen said. "Let's check that equipment the surgeons put in your neck." Stetson put a hand to his own throat. His mouth remained closed, but a surf-hissing voice became audible to Orne, radiating from the implanted transceiver: "You read me, Orne? ...touch the mike contact. Keep your mouth closed. Just use your speaking muscles without speaking aloud." David Brin wrote about it quite specifically in his 1990 novel Earth. NTB: What does it look like, and is it a user-friendly technology?